A friend of mine ordered a cake for his fishing trip. He gave me carte blanche. 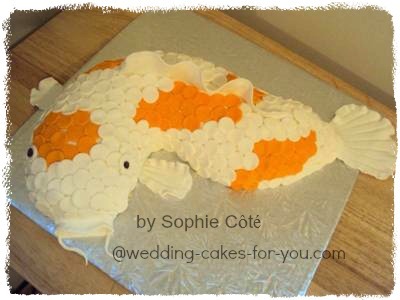 I decided to make a fish-shaped cake with a twist... koi! I thought for a while about what cake mold I would use to minimize the need for sculpting, and I finally opted for a bundt mold. Once the cake was cold, I cut the circle in half and slid the right half down to make an S-shape. From there, I sculpted the cake to give it as graceful a curve as I could. I garnished the cake (lemon-flavored) with strawberry jam and crumb-coated it with vanilla buttercream. Then I covered the fish with a first layer of white fondant. I patiently cut out a ton of white and orange fondant circles with a fondant cutter and placed them all on the fish to mimic the scales. That is one of the most creative cakes I have seen. Its very beautiful. Thank you for sharing the photo and also telling us how you did it. Its amazing. Patience is a virtue when decorating cakes like this. I'm sure your client was very happy! Awesome! I would never have thought to use a bundt pan. You are so creative! Thanks for including the steps! You're very talented!